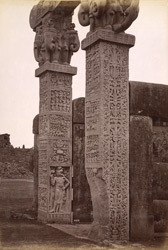 Photograph of the pillars of the northern gateway of the Sanchi stupa in Madhya Pradesh, taken by Deen Dayal in 1882, from the Lee-Warner Collection: 'Scenes and Sculptures of Central India, Photographed by Lala Deen Diyal, Indore.' The great stupa of Sanchi is the finest example of monumental architecture of the Shunga era (c.185-75 BC). It consists of a large hemispherical dome which was built over an already existing stupa ascribed to the 3rd century BC from the time of the Buddhist emperor Ashoka Maurya (reigned c.269-232 BC). The stupa was later enlarged around the 1st century BC under the Shungas and four elaborately carved gateways or toranas were added at the cardinal points. The northern gateway consists of two square posts crowned with a group of four elephants and two shalabhanjika, females figures grasping the branch of a tree. These support a triple architrave with scrolled ends. The gateway is completely covered with sculptures depicting various episodes of the life of Buddha Shakyamuni represented aniconically; his presence is indicated by emblems such as footprints, a wheel or a trident and an empty throne beneath the Bodhi tree, the tree under which he obtained illumination.